Rain, rain, go away! I was really excited about the course that I had designed for this event. It was going to be very fast (for Dolaca Motorplex), and I was really looking forward to competing. However... I didn't expect it to rain. When I got there and started setting up the course, it had stopped raining and looked like it might clear up enough to make our runs on a somewhat dry course. I was running in the first heat, so I was really hoping for it to stay dry long enough to at least complete 3 or 4 runs in the dry (who cares if the second heat gets rained on, right? ). 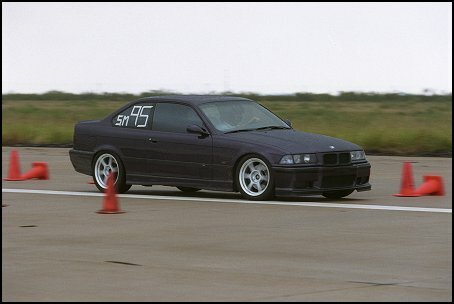 The track was almost completely dry when we started, and I waited until the very last minute to swap over to my racing tires (which barely have any tread left on them, so they're practically slicks!). I got my tires swapped, pulled into grid, and almost immediately got to pull up to the starting line, but as I was pulling up the rain just came pouring down. I probably could've switched back to my street tires to get a little better traction in the wet conditions, but decided that it wasn't worth it to get soaked. 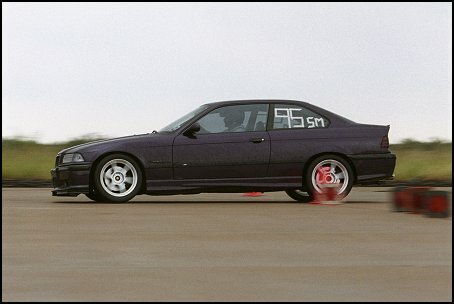 The M3 actually still handled the corners pretty good in the wet, but I had to be really gentle on the throttle or the back end would lose traction very easily. I managed to run some pretty good times considering the conditions, but Steve Sucsy (B-Stock Honda S2000) was a little more prepared than the rest of us and had a set of Hoosier racing RAIN tires. To Steve's credit, he ran on the rain tires for three runs then swapped over to his normal racing tires (i.e. - slicks) and still ran just as good as he did on the rain tires. He was able to edge past me by 0.163 seconds raw time, which gave him a 0.650 second PAX lead to take the Overall win for this event. This was my first time to compete in the rain, and I have to admit that it was a fun challenge, but I still wish it had been dry. I'm going to set up the the course exactly the same when we return to Dolaca Motorplex in November, because I don't want to waste that great course design on a rain day! With the points from this event, I'm now in second place in the Championship points standings, so it wasn't a total loss!